With their easy, defensive-oriented win over the Red Foxes of Marist, the Lady Vols march deeper into the madness. You always hate to see a Cinderella bow out, but at least they didn’t advance at the expense of Tennessee. 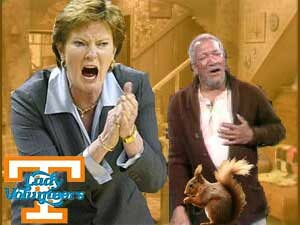 How much further will Pat’s Lady Vols go? Hopefully to the pinnacle, but there’s never a guarantee of that. They’ve disappointed at this level in recent seasons. Let’s hope they break the pattern and climb back on top. Newscoma and I have become hooked on a new TV show – Ninja Warrior – on the G4 network. Other than the Arrested Development reruns, it’s likely the only thing anyone would spend time watching on this channel. 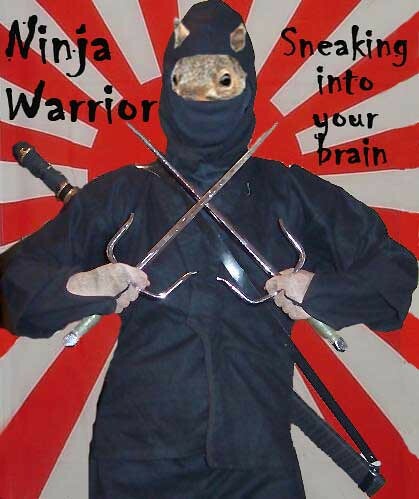 Ninja Warrior is a Japanese game show that is an outrageous physical competition that pits 100 athletes, celebrities and freaks competing on an obstacle course. This is not just any obstacle course. It has four levels and only two people have ever completed all 4 levels. On average about 9 out of the 100 pass the first level. It’s preposterously impossible. Those who fail splash down in ungainly crashes into muddy pools below the obstacles. The few who get through the first two levels are then challenged by a third tier that punishes nearly all who attempt it. The upper body strength necessary to complete this is incredible. In addition, the subtitles and overwrought drama they relate are pretty funny too. Here’s a promo for Ninja Warrior on the G4 site. The network reruns episodes frequently so there’s bound to be a time when you an catch it or at least Tivo it. It’s definitely addictive. Coma laughed at me the first time I suggested we watch it together. I’d already succumbed to its viewing pleasures. She soon joined me in its growing legion of fans. So I’ve been on the road a lot these past few weeks going to tournament basketball games and I’ve made some late night stops in convenient stores, which always leads to bad decisions. It says right in their name “convenient”, not “smart shopping stops”. I walk into the bright glare of the fluorescent lights. There’s a rumble in my tummy. I haven’t eaten in a few hours and after most of these games, I’m ramped up a bit. So I traipse through the three aisles, moving right past the cans of motor oil and antifreeze and over-priced household items and over-the-counter pharmaceuticals that people only buy here in an emergency in the middle of the night. That’s when I espy what I’ve been seeking. The siren song that has charmed and lured me into the facility in the first place – the snack food section. I peruse the candy bars, immediately eliminating my least favorites as a potential option. Wait, would a visit with Little Debbie be a better choice? Ok, these would satisfy the need for sweets. But what about the salty snacks? Chips and nuts. Yeah, salty may be winning out. And that’s when something catches my eye that I didn’t expect to attract my attention. Right in front of me, in its bright red and yellow plastic wrapper almost dancing on the shelf like the foods in the cartoons at movies tempting you to head on out to the lobby. A Slim Jim. I think to myself, “When’s the last time I’ve had one of those? That might be a nice change of pace, something a little different.” So I grab one of the slender sticks and head to the counter, forking over the change necessary to complete my purchase. At home, settled in front of the TV, winding down after the game, I peel back the eye-popping wrapper, pondering that it’s probably been a least a couple of years since I’ve snapped into one of these meat sticks. Then I take that first bite and I’m pretty much immediately repulsed. I certainly don’t remember the outer “skin” on these things being so tough and thick. Maybe it’s just me, so I take one more bite and, yup, it’s not me, it’s this nasty dark brown snack that’s chock full of strange spices and seasoning mixed with whatever beasty they’ve ground up and stuffed inside a cardboard-like sheath. Needless to say my hounds weren’t nearly as picky as me. They woofed down their shares of the remainder of my snack-choice gone awry. I’ve officially sworn off Slim Jims. Tossing them into the same category as Funyuns, another food item that is only purchased after 11 p.m. in convenience stores and no longer to be purchased by me. 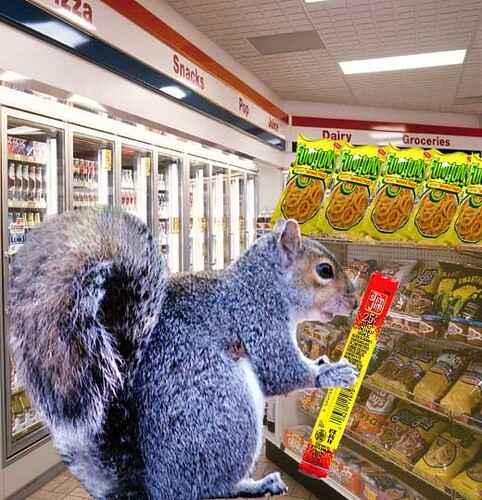 The way this used to happen – there I am strolling the aisles waiting to find a culinary inspiration when a bag of Funyuns snags my attention. The influence of alcohol is often another factor in the purchase of these vile onion-flavored snacks. The bag is ripped open and after two bites, I recall, even through a beer haze, why it’s been four years since I’ve had this styrofoam consistency coating the inside of my mouth. These things are dang nasty. I believe this is why you rarely see giant-sized bags of Funyuns in grocery stores. No one without a minimum of four beers fogging their system would buy these things. Snack-sized bags only and available, for your convenience of course, in a quick mart on a corner near you. Lesson learned – caveat emptor my convenience store cruisin’ cohorts. Yahoo!! Spring training has put an extra spring in my step. It’s official for me now, baseball is here. I got to see the bottom of the 10th inning of the Braves/Bucs game yesterday.It was my first baseball other than the highlights of the Sportscenter variety. I’ve been reading up some on all the spring training doings, but there’s sure nothing like watching it for yourself. Most people consider live baseball boring, but for me the fact that there is no game clock and the diamond game has its own pace are the best parts of it. Clocks create crescendos at the end of every quarter or half. With baseball, a half inning can take forever or be over in 3 pitches. You never know when a team will bat around and pummel a pitcher or the man on the mound takes control and dominates. I’ll admit, I do like to watch pitchers who work faster than those who have to rub up the ball before every pitch or shake off a half dozen signs before throwing a fastball. But even that can ramp up the anticipation. Baseball lets you fall into it, you get absorbed into the rhythm of pitcher to catcher. 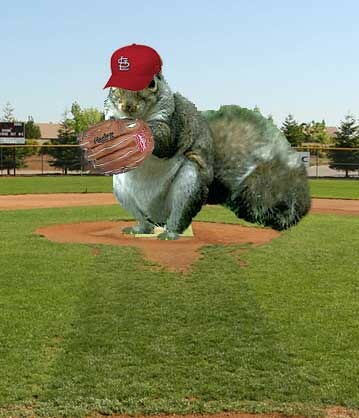 I’ve been antsy for the season for weeks now to get into a baseball groove. And there’s nothing like listening to a game on the radio, driving with the windows down as you travel through the night. I love it. And I’ll be in heaven all the way into October.